The new year is already a week in and the good weather has finally hit us in Exmouth, with calm clear waters. The wind certainly gave the whole coast a hard time for several weeks, so it is fantastic to see people able to get out and enjoy the ocean. That’s exactly what many teams did over the weekend for the Tantabiddi Camp Out. This fun weekend is designed for relaxation, families and friends to camp around at Yardie Homestead and fish either from a boat or the shore in search of a variety of species. It’s also extra fun for kids young and old to enjoy cricket on the grass, swimming in the pool and a causal bbq dinner. The fishing was a little slow, but some interesting catches still showed up for the 50+kids and adults. Team Horne never disappoint, with 36 species caught and released with photos from the shore this year. Yes, that is thirty-six in just two days! The junior team with Dylan Starke also did well with 7 species caught and released with a photo. Every entrant is given a junior rod and reel combo from Exmouth Tackle and Camping and there is a prize for the heaviest fish caught on this small outfit. Kurt Decker won the adult section with a spangled emperor weighing 3.3kg, while Kalvin Gates won the junior section with a golden trevally weighing 3.6kg. Kalvin did have a bit of help when the fish nearly spooled him and his Dad jumped in the water to stay connected and bring the fish in with the help of another passing vessel, but the effort was so much that he was awarded the prize. The heaviest Charlie Court for a junior was 550gm by Jake Owens and 450gm by Glenn Passmore. Junior angler Jayden Waddingham caught the biggest spangled emperor for that section with a 3.6kg fish and Kurt Deckers spangled emperor won the adult spango section. Zac Owens caught the heaviest mackerel with a 6.1kg spanish and a huge thanks to Steve and Louise Riley for the great prizes. The bluewater scene has picked up as the warmer water comes down from the north. Large yellowfin tuna show up at this time of year and there has been a few medium sized ones caught already. Striped, blue and black marlin have been in the spread with several boats getting the opportunity to get grand slams. Most teams are gearing up for eth Heavy Tackle Tournament in a few weeks and it looks like being another successful event with many crews entering already online. Junior angler Callum Horlock was fishing the camp-out and targeting mackerel, when he caught a sailfish just outside Tantabiddi north passage. Another sailfish was seen in just 13m of water at the back of the reef on the same day. Shore based anglers have had some magic days and success, with so many species coming through on the flats, particularly around the high tide. The gulf has had some massive queenfish still, along with the ever-present whiting and the odd big flathead. Mangrove jacks have started to really show up and eat well and it’s great to see our healthy gulf with such abundance. This is a safe area to take the kids with little concern about waves or rocks with the lovely beaches. We do like to remind locals and visitors though, that stonefish are in this area and to be careful of them if the kids are walking in the water. There was even a huge stonefish at the marina boat ramp last week that could have easily been stepped on by an adult or child. The stonefish is one of the most venomous in the world, with the sting mostly being injected through their spines when people step on them. It is recommended to have vinegar with you at all times to liberally use to help comfort the person on route to the hospital, along with hot water if possible. Stings are painful and if left untreated can lead to death. Having said that, there has not been many cases at all in this area, but please be cautious. ​Product of the Week: Dry bags. They come in various sizes. Brightly coloured too, so perfect for your grab bag on board your boat. The large yellowfin tuna have definitely showed up as expected for early January. Several boats have been getting blistering runs on heavy gear while out targeting billfish in deep waters. Captain Eddy Lawler has reached another great achievement this week after releasing his 20th grand slam for billfish, which includes that amazing statistic of three species of marlin each day for three consecutive days (that I have written about previously in this report), which we believe has never been done in the world. The International Game Fishing Association listed record for grand slams for a skipper is 17 and we are certain no other Australian skipper is even close to this amazing figure of Ed’s. Thanks Eddy, for showcasing how healthy and fantastic the fishery is here, and for the tagging efforts that help us to learn more about the billfish that frequent these waters of the Northwest. The Heavy Tackle tournament is just around the corner, with many people already entering on line. This event is designed for 37 and 60kg tackle targeting fish in depths over 250m. There are some great sponsors and organisers of this event, which is growing to be another major tournament on the EGFC calendar. Crews have been practising and carefully watching the weather forecast. The target species is marlin, while other by-catch of large yellowfin tuna, sailfish or wahoo are expected. There is a section this year for best dressed team on Australia Day too, so it should be good fun. The baby turtles are hatching again, which means that the shoreline is being patrolled constantly by predatory species such as spangled emperor, trevally and sharks. Walking along the beaches at this time of year is mind-blowing with the amount of turtle tracks from females laying each night. Sadly, a lot of baby turtles don’t make it, but that is mother nature. Some of the females don’t survive either, but again it is mother nature’s way of working as a dead turtle can then feed many crabs or sharks that may have fed on baby turtles instead. Having said that, surface lures from the shore are working well at present and the waters have been crystal clear with little swell, so we recommend using fluorocarbon leader. The mangrove jack competition is heating up with over 20 entrants now aiming to catch a jack from the marina and get a pic of the biggest one on a brag mat before the end of February. It is just $25 to enter and winner takes all. Baits have been the most successful, while some anglers have been using slow sinking lures. The mangrove jacks have shown up in really big numbers in all areas including the west side, gulf and marina, which again is a sign of the healthy fishery we have here. Drop in to Tackle World for further details and enter. Product of the Week: Sun protection gloves. Perfect to stop you getting burnt and handle fish for release. Plenty in store. Groups of guys and girls have been visiting here on extended trips to get out deep and target the billfish that Exmouth is renowned for. The black marlin have already started to show up in big numbers with many reports of fish tagged. The big blues are about, while the striped marlin are becoming less seen. Jake Owens, aged just 7, hooked up to what was believed to be a blue marlin at first, but turned out to be a massive sailfish estimated to be 100kg. Jake did an amazing job on the rod and reel, while his brother Zac (aged 9) encouraged him. The day prior Zac had caught 2black marlin, a sailfish and a blue marlin, although the blue marlin didn’t stay connected for a tag shot. The excitement is building for the Heavy Tackle Tournament that is on this long weekend. Plus, interest is building for the Billfish Bash and GAMEX in March. Lots of locals have been having some brilliant staycations in our beautiful back yard and enjoying the camping and fishing on the beaches with few tourists about. The lack of swell and incredible water clarity coupled with calm warm weather (at times) has helped create some amazing experiences that many have shared on social media. Shaun Tunstall was one of the lucky locals that managed to also get a cracking fish from the shore with the chinamanfish pictured this week. It was caught off the beach using cooked prawn as bait. These fish are a delight to eat and it fed many happy crew that night and the next. The recent neap tides and calm waters helped divers get out and into the water with spearguns. Daniel Haliday from Perth got into a mixed bag in the gulf with bluebone, coral trout and spanish mackerel. He also bought a cray loop and snared an ornate, green and red rock lobster. As the Exmouth Shire slogan says- spoilt for choice. School holidays are almost over, but there are plenty of options in Exmouth for youngsters to keep occupied with fishing. The marina and beaches close to town are good short distances to get kids a fish. 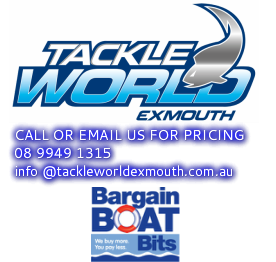 If you’re new to town or not sure what’s on offer, drop in to ask at Tackle World Exmouth. Product of the Week: Ski biscuits. All watersports equipment for a great Australia Day long weekend including ski biscuits, safety vests, tow ropes and more in store. 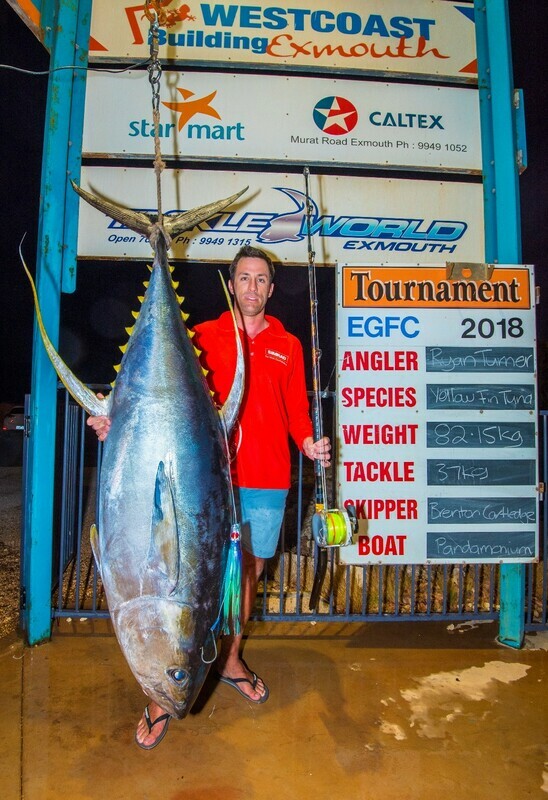 The Exmouth Game Fishing Club hosted the Heavy Tackle Tournament over the Australia Day long weekend and 27 teams with just over 100 anglers hit the waters in search of big marlin and yellowfin tuna. The weather was ominous with Cyclone Riley looming to the north and creating some concern for the organisers. Luckily the cyclone headed west, however the last day was cancelled with forecast strong winds. The small black marlin certainly showed up for the teams in all areas with several being caught on the big gear. Two blue marlin were encountered by team Mangrove Jack in the space of 20minutes. Team Pandamonium released a solid blue estimated at 550lb. Over the two days, black, blue and striped marlin were all encountered, along with sailfish, proving yet again that this is a world class billfishery. Adding to the great billfishing is the ever-increasing XOS sized yellowfin tuna being more readily encountered by anglers who are targeting blue marlin out wide. With good numbers of these speedsters being hooked each day, it is showing us just how prevalent they are in the area. The camaraderie at the game fishing club was at an all-time high with some of the best anglers in the state pitting their skills against each other over the duration of the tournament. Crews talked fishing for hours over good food and cold drinks, while the organisers are already planning for next years’ event. The marina has been continuing to show locals and visitors how healthy and amazing it really is with schools of bait, predatory species, big cod, hungry jacks and cruising dolphins through it regularly. Squid have also been showing up inside the marina of late. 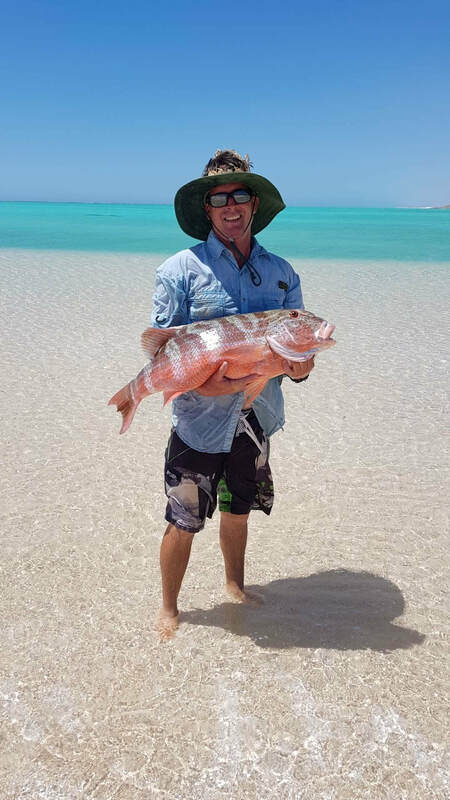 Holiday houses with private jetties have had visitors in awe at the amount of species that call the marina home, while a few large resident qld gropers have also been rather friendly. The mangrove jack comp has had a few new entrants with the prize pool around $500. The largest to date is only 43cm, but we know there are plenty of larger ones out there. The spangled emperor have continued to show up in large numbers from the shore around the west side. Surface lures work really well at this time of year for them and dawn and dusk is always the best time to target them. You can expect to get other predatory species such as trevally and barracouda. The large queenfish have been more prevalent in the gulf than the west side and they are awesome to target on fly fishing gear, if you’re keen to walk the flats. Product of the Week: Cooler Bags. New stronger designs in store now. Great for your yellowfin or wahoo. PIC: Pete and Lachlan Norris with Lachy’s first dolphin fish. Dean Gates with his first sailfish. 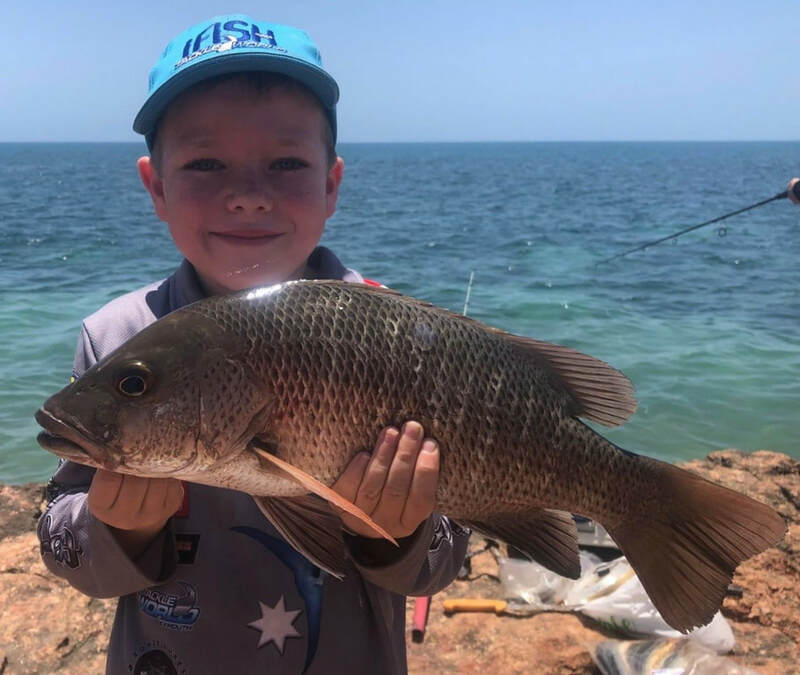 The last weekend of school holidays brought some sensational weather for the local families to get out on the water in search of a fish or two. Several crews headed inside the reef off Tantabiddi where the water was crystal clear and glass calm. Matt and Mason Burkett managed to get in to some decent sized spangled emperor and charlie court. Baits are best at anytime of year inside the reef and if you have a big bait cast far with no sinker it seems to work well, as the bait lands on the surface and slowly drifts through to the sand flat in the shallows. If you prefer to use lures, stick baits and poppers can be dynamite on these species too. Soft plastics tend to attract more of the trevally species and the ever-present charlie court, while metals are great for queenfish. The Norris farming family from Geraldton come to Exmouth nearly every year for a holiday in January and this year they spent a good 3weeks relaxing and enjoying the great little town we have. On their last day they got an invite to fish for pelagics. 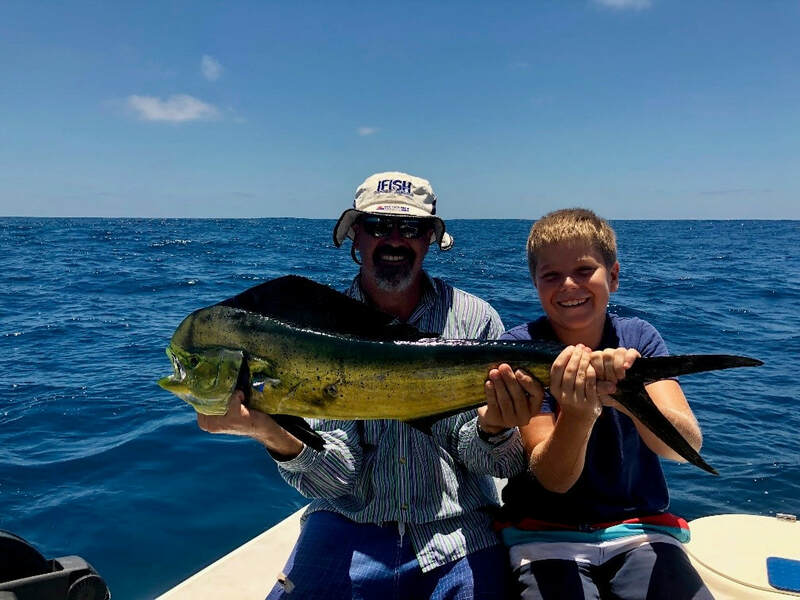 Youngster Lachlan Norris landed his first mahi mahi and is pictured this week with Dad Pete. The crew headed west of Tantabiddi and straight in to a mass of coral spawn and green water. Within this were birds feeding and schools of fish. A massive manta ray was playing on the surface with a decent cobia hanging around it. The crew headed west until the water was blue in about 400m and raised a black marlin, caught a rather large striped tuna, landed two dolphin fish and fellow junior angler onboard, Dean Gates (4yr old) tagged his first sailfish. It was certainly a day of making memories for the kids and adults and we are certain they will be back next year. The fly fishing has been nothing short of insane for the punters of local guide Brett Wolf with some incredible reports on large permit, golden trevally and bonefish. Despite the months of January and February being relatively quiet for the town, the fishing is amazing and when you get a good weather window, it usually results in many happy snaps. Anglers wishing to fly fish from the shore can expect all sorts through this time, but please do come prepared for the heat by wearing appropriate sun-protection clothing and having lots of drinking water. The 40+ days with no wind are a scorcher for any person. Product of the Week: Knife Rolls and filleting gear. We have a huge range in store. Drop in today to see how we can help.